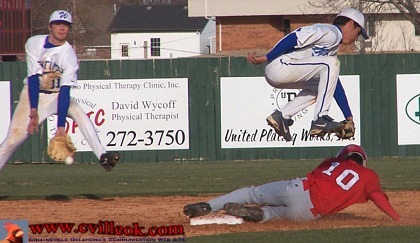 Lane Coulter (#10) slides into 2nd with a stolen base in Monday's CHS game with Glenpool here. Jeremy Guest was on the mound for the Cardinals Monday. I don't have a rooster yet but see a good mix of experienced players and new faces for the 2007 Baseball Cardinals. 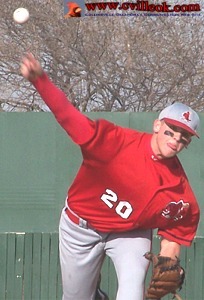 Brad George helped the Cards turn a double play to end Glenpool's half of the 3rd inning. 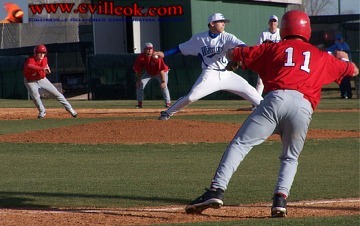 Kevin Phillips (#4) on 1st and Tyler Nair (#11) on 3rd take a lead as the Glenpool pitcher starts his delivery. 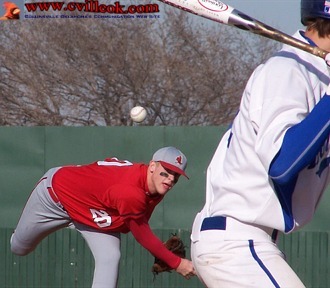 Tyler reached on a 1-run triple in the second inning to put Collinsville up 2-0. 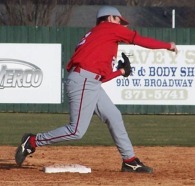 A 2-run double by Shawn Curtis and a 1-run Nair double had Collinsville up by 5-0 when I left in the 3rd inning. Final score in the Tulsa World was 11-1. The new press box is nearly complete. 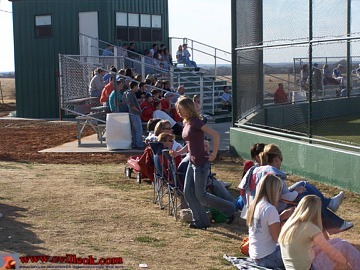 The new seating and backstop netting were ready for a nice opening day crowd. The nearly 70 degree weather even made it feel like baseball season with basketball barely finished. David Chester and Kevin Phillips played baseball Monday afternoon before heading to Cleveland for the All-Conference Basketball game.